Mother & Daughter Enjoying Life as Retired Roomies - Grace Ridge Retirement Community - Morganton, N.C. When Nancy Hendrickson, 65, and her mom, Jeanne, 94, were holed up in a hotel room after evacuating from Hurricane Irma last September, they began fantasizing about hurricane-free places to move. And so began a seven-month search for a retirement community where mother and daughter could live together for the first time since Nancy headed to college. Nancy took her relocation homework seriously and researched more than 50 retirement communities online before deciding to visit four in person. The Hendricksons’ decision to move in together was a financial one, so affordability was at the top of their checklist. Too neglected. Too hilly. Too unfriendly. Just right. 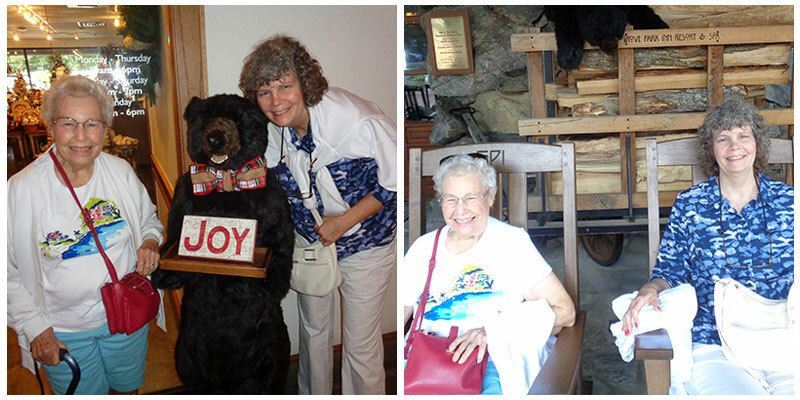 In January, Nancy and Jeanne made their first trek to North Carolina to visit a retirement community in Burlington. They returned home disappointed after seeing it was located in a bleak neighborhood surrounded by abandoned buildings. They continued their online search and returned to NC a couple of months later after narrowing their list to three communities: one in Hendersonville, one in Fletcher and Grace Ridge. The communities in Fletcher and Hendersonville were quickly ruled out. One retirement community had difficult-to-navigate hills and the other was dreary, musty smelling and unfriendly. In fact, while Jeanne attends Grace Ridge University classes, takes trips with the Travel Club or catches a Saturday night movie, Nancy busies herself with the choir, working in the library and reading on the balcony. Highlights include a surprise trip to Daniel Boone Native Gardens and Howard’s Knob Park in Boone and visits to Omni Grove Park Inn in Asheville, Black Mountain, Linville Caverns and Little Switzerland. On the “must-see” list? Easily accessible waterfalls. Mother and daughter haven’t lived together under the same roof in more than four decades, so it’s no surprise there were some compromises made – from cooking techniques to temperature control. Jeanne loves onions in everything; Nancy hates them. Nancy loves open windows and fresh air; Jeanne gets hot and cold easily. Vegetable aversions aside, their fondness and playfulness with each other is evident. Jeanne described Nancy as outgoing and helpful and said she takes good care of her and worries about her – even when she shouldn’t. “’I want to do it by myself!’ That’s what she used to say when she was younger and I’m about ready to tell her that now!” Jeanne said. Nestled in the foothills of the beautiful Blue Ridge Mountains, Grace Ridge is a Life Plan Community spanning 52 pastoral acres in Morganton, NC. Come for a visit and find out why our community repeatedly garners awards, high rankings and superior satisfaction ratings as one of the best retirement communities in North Carolina.